The Hubble eXtreme Deep Field combines 10 years of images to capture the most distant galaxies ever seen. Scientists make use of the "universal speed limit" imposed by the speed of light to observe the early universe with NASA's Hubble Space Telescope and other instruments — and the space agency's forthcoming James Webb Space Telescope (JWST) should allow them to observe the earliest galaxies. "When we look at something that is many light-years away, the light has traveled for many years," Gardner added. "That means we see things as they were when the universe was much younger than it is now." Light travels at 186,000 miles per second (300,000 kilometers per second). In the world around us, that's too fast to really notice. "If I have a conversation with you, there is always a slight delay," Joel Green, project scientist at the Space Telescope Science Institute in Baltimore, which operates Hubble's science program, told Space.com by email. "It's a lot smaller than the delay in getting the signal from our eyes to our brain, so we don't worry about this effect in everyday life." But when stretched over the vast timescale of the universe, the delay is more noticeable. When scientists observe an object that is billions of light-years from the sun, they see the light as it was when it left the object billions of years ago, rather than as it exists now, allowing for a sort of "time travel" of sight. "By comparing the most distant galaxies to nearby galaxies — and those in between — we can build up a picture of how galaxies form over time," Gardner said. To do that, astronomers compare galaxies that they think are similar in terms of size or other properties, viewing them at different stages in their evolution. Computer models then help connect the dots in between. Such time travel has its limitations, however. While scientists can observe distant objects as they appeared billions of years ago, they can't see local galaxies as they existed in the distant past. The nearby Andromeda galaxy, for instance, lies 2.5 million light-years from Earth, so scientists can only see it as it was 2.5 million years ago, a relatively recent time frame in astronomical terms. "We can't somehow look at Earth in the past and see dinosaurs," Gardner said. NASA's James Webb Space Telescope, which is scheduled to launch in 2018, will allow scientists to peer farther across the universe — and farther back in time — than ever before. Taking a snapshot of the early universe is not without its challenges. The farther away an object is, the fainter the light it emits; think about how much more challenging it is to see a flashlight glow from 1 mile (1.6 kilometers) away, as opposed to 1 foot (0.3 meters) away. In recent years, Hubble has performed this task admirably, peering across greater distancesthan previous instruments could. "The oldest galaxies Hubble can see are from the universe's 'teen years,' about 12 to 13 billion years ago, when [the universe] was about 1 billion years old," Green said. 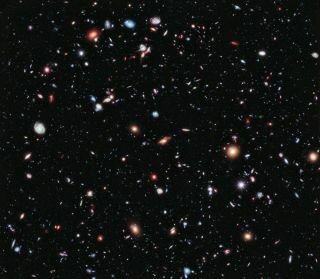 The faintest picture ever taken, the Hubble Ultra-Deep Field, reveals these distant galaxies. But according to Gardner, some of the galaxies in that image were already a few hundred million years old when the light was emitted, which means that Hubble isn't capturing the very first galaxies that formed after the Big Bangcreated the universe 13.82 billion years ago. Enter the James Webb Space Telescope, which is scheduled to launch in late 2018. Webb will be larger than Hubble, with a primary mirror diameter of 21.6 feet (6.6 m) compared with Hubble's 7.9 feet (2.4 m), which will allow the new observatory to see fainter objects. "We think those first galaxies formed at about 250 to 400 million years after the Big Bang," Gardner said. "Webb is designed to be able to detect them." Spotting those original galaxies isn't just about mirror size, however. Because the universe is expanding, the wavelengths of light leaving the most distant objects are stretched from the visible spectrum into the infrared and microwave. "The very first picture of the universe is called the cosmic microwave background," Green said. "It's a picture of the universe when it was only 378,000 years old, 13.8 billion years ago. The imprint of this picture is written across the sky in microwaves coming from all directions that we have detected with space telescopes like NASA's WMAP and [the European Space Agency's] Planck." Such stretching renders the most distant galaxies invisible to the Hubble Space Telescope. According to Green, the cosmic microwave background reveals a lack of stars and galaxies, while Hubble can detect galaxies from the universe's first billion years. "Somewhere in between, there was an era of time when stars and galaxies turned on, forming and lighting up the universe," Green said. JWST should be able to break through the mystery surrounding the first galaxies. In addition to a larger mirror, the telescope is optimized to view infrared light, allowing astronomers to see stretched-out wavelengths hidden from Hubble. "It should see the time when these stars and galaxies turned on, which will tell us detailed information about the early history of the universe — what the role of dark matter was, how long it took to make the first stars and how long they lasted, when the heavier elements formed — a huge origin story of the universe," Green said.